This is a great holiday spread for crackers or bread. Put pecans, salt, sage, garlic, and butter into a food processor and process on high adding the olive oil slowly until you have a spread like consistency. Yes it’s that easy. This entry was posted in Photos, Recipes, Sides and tagged pecans, sage on December 19, 2010 by kaylie. This relish is perfect by itself or served on top of Vegan cream cheese. The other night I used it as a garnish for our squash, wild rice, sage and asparagus cabbage rolls. Bring something freshly made to a holiday party this year and impress your grandma. Mix and chill before serving. This entry was posted in Photos, Recipes, Sides and tagged red pepper on December 13, 2010 by kaylie. Who wants tortillas from a grocery store anyways? I find the politically correct mexican bowl to be one of my favourite dishes because it’s fast, flavourful, easy and reminds me of my mom. Garnished with fresh tomato, lettuce, salsa, avocado and roasted zucchini. You could replace the potatoes with rice or spanish rice, sautéed vegetables for tofu and black beans for pinto beans. Try replacing salsa with a tomatillo sauce or try adding guacamole. Cut tofu into 1cm cubes and place into a medium sized bowl. If using canned chipotlé use one pepper and mince put into bowl with tofu along with all of the other ingredients. Let the tofu marinate for at least fifteen minutes and place in oven at 400 degrees for fifteen minutes. This recipe is spicy! This entry was posted in Dinner, Photos, Recipes and tagged avocado, mexican, potatoes, tofu, tomatoes, zucchini on December 9, 2010 by kaylie. After a long night of drinking, kissing and eating it’s important to reinvigorate your body with a flavourful breakfast. It isn’t to hard to use elements of last night dinner to create a tofu scram that is more satisfying than the dinner you had the night before. Place garlic, 1 tsp salt, 1/2 block tofu, & portobello tomato sauce in a bowl and let set until you are done prepping everything else. In a skillet, sauté onions rings with vegan margarine until slightly brown and caramelized. Add sliced mushrooms, cherry tomatoes and tarragon until mushrooms and tomatoes are slightly soft. Add tofu mix, a pinch of salt and kale. Let simmer stirring occasionally for about 10 minutes in total. Add zucchini last and only let the whole mixture sauté for only 3 minutes more, you don’t want your zucchini to be over cooked! Plate your scram and add a squirt of lemon juice on top! Make toast, slice fruit, pour coffee and eat! This entry was posted in Breakfast/Brunch, Photos, Recipes and tagged kale, leftovers, lemon, onion, tofu, tomato sauce, tomatoes, zucchini on November 24, 2010 by kaylie. Pre-heat your oven to 400 degrees. Cube your red potatoes, place on a baking sheet, lightly cover with olive oil, add rosemary and garlic. Let roast for about ten minutes watching diligently and flipping around your potatoes every few minutes. Roasted until golden brown. Cut all of your onions into cm rounds and caramelize in a spoonful of (vegan) butter in a skillet. Dice your green apple into small pieces. Once your potatoes and onions are ready, add the potatoes and half of the onions to the soup. Add the unsweetened nondairy milk and nutritional yeast. Using a hand blender, blend the soup until creamy. Now, add the rest of the onions and the apple. Let it simmer – the longer the better – half an hour is probably good, but if you have longer, go ahead and let it simmer. Now you have soup. Serve with a sprinkling of nutritional yeast on the side. This entry was posted in Dinner, Photos, Recipes and tagged apples, leek, potatoes on October 23, 2010 by kaylie. This salad just happened to be a part of mine and Malloreigh’s autumn feast. This attractive salad was promptly inserted into my belly, leaving me full of bliss and beets. Heat up a skillet and toss in your cranberries and pecans. Add 2 tablespoons of sugar and 2 shakes of salt along with a few shakes of rosemary powder. stir around until the sugar has coated the pecans and cranberries and has dissolved. Let cool. Finely dice the Kale and flash steam for one minute. Cut your beets into thin slices using a knife or mandolin. Once you have flash steamed the kale put it in the fridge until cooled (or the freezer for a faster chill time). Add your beets and mix around to create a vibrant melange of green and pink. Cut your shallot into rings, add the shallot, soy sauce, lemon and white wine vinegar. Add the Pecan mixture to the salad, mix together and serve! This entry was posted in Dinner, Photos, Recipes, Sides and tagged beets, kale, shallots on October 19, 2010 by kaylie. I recently went on a bike trip with my brother down the west coast. I was met with a barrage of questions on how I could stay true to my veganism during such a strenuous adventure. Here are a few creative recipes that kept my brother and I energized while on the road. 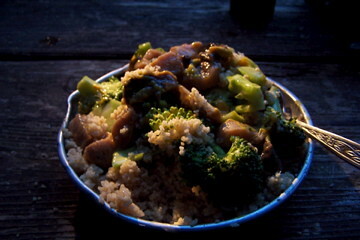 This entry was posted in Breakfast/Brunch, Photos, Recipes and tagged broccoli, camping, oatmeal, peanut butter, travel, tvp on October 14, 2010 by kaylie. Sauté Onion & garlic until translucent and slightly browned. Add the sliced mushrooms, garlic, and crumbled tempeh, squash and continue to sauté until every thing is cooked throughly. Roast the Banana peppers in the oven for about 7 minutes at 400 degrees. Once the banana peppers have had a chance to cool cut them vertically from top to bottom. Stuff your peppers with the filling and daiya just enough so no filling is coming out of the peppers. Seal the peppers shut by sticking toothpicks diagonally across the slit of the peppers piercing the flesh. Stick the peppers in the freezer and let freeze for at least an hour. Whisk the dry ingredients with the wet. Heat a frying pan with a layer of vegetable oil. Take the toothpicks out of the peppers. Dip the peppers in the batter so that they are nicely coated and then fry making sure to rotate the pepper on all sides with tongs. Once the peppers are browned place them in the oven at 350 degrees for 5 minutes. Let cool and have a fiesta in your mouth. This entry was posted in Dinner, Photos, Recipes, Sides and tagged banana peppers, daiya, mexican, mushrooms, squash, tempeh on October 6, 2010 by kaylie.